Moisture protection taken to the next level. DryPly® plywood Sturd-I-Floor® panels feature a water-repellent coating that provides excellent weather protection during construction. In fact, the coating on this tried and tested sub-floor helps reduce water absorption by up to 40%. There’s no better way to protect your sub-floor, reduce time-consuming sanding and minimize callbacks. Our lifetime limited warranty says it all. Exposure 1 : Plywood suitable for uses not permanently exposed to the weather. Panels classified as Exposure 1 are intended to resist the effects of moisture on structural performance as may occur due to construction delays, or other conditions of similar severity. 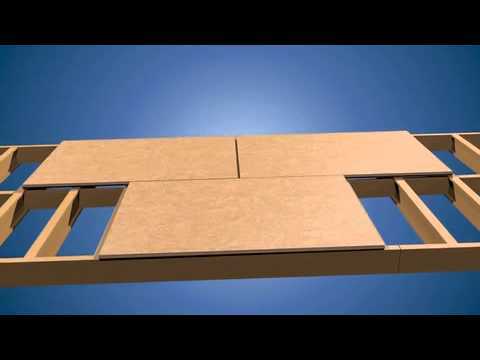 Sturd-I-Floor® is an APA designation that is a combination subfloor-underlayment produced from OSB or plywood. These panels feature a built-in underlayment that allows the convenience of using only Sturd-I-Floor® under certain finish flooring, especially carpet and pad. What is the proper way to store plywood on the yard or on a job site? Whenever possible, store panels under a roof. Keep sanded panels and appearance-grade products away from high-traffic areas to prevent damage to surfaces. Use pieces of lumber to weigh down the top panel in a stack to reduce warpage from humidity. If moisture absorption is expected, cut steel bands on bundles to prevent edge damage. If panels must be stored outside, stack them on a level platform supported by at least three 4x4s to keep them off the ground. Place one 4×4 in the center and the other two 4x4s 12 to 16 inches from the ends. Never leave panels or the platform in direct contact with the ground. Is there a difference between span ratings for OSB and plywood? No, span ratings for similar thicknesses are the same. What is the flame spread classification for plywood? What is the difference between Structural 1 and Exposure 1 panels? Structural I refers to certain specialized strength and stiffness characteristics of wood structural panels while the term Exposure 1 refers to the glue bond durability of a wood structural panel. Structural I, also referred to as “STRUC I”, may be OSB or plywood and is, essentially, a subcategory of APA Rated Sheathing. Panels designated Structural I must meet all of the manufacturing and performance standards of Rated Sheathing, as well as certain additional requirements. The advantages of Structural I Rated Sheathing over standard Rated Sheathing panels of the same Performance Category are realized in certain specialized engineered applications such as engineered shear walls and engineered horizontal diaphragms. Specialized construction situations requiring installation of roof sheathing panels with the strength axis parallel to supporting structure also benefit from the use of Structural I sheathing. Structural I is of no additional benefit for other traditional construction applications. Consult a professional engineer for specific applications. What does the stamp on my plywood panel mean? On every Georgia-Pacific sheathing panel you should be able to find an APA grade stamp. This stamp is your assurance that the product is manufactured in accordance with the APA’s rigorous program of quality inspection and testing. The grade stamp on a panel also tells you a lot about the panel – the span rating, exposure rating, panel thickness and the building code approval the panel meets. What does the "span rating" of a plywood panel mean? Within the grade stamp on a panel you will find the span rating. When there are two numbers separated by a slash (i.e. 48/24), the first number is the maximum recommended center-to-center spacing for supports in inches when the panel is used for roof sheathing with the long dimension across supports. The second number is the maximum center-to-center spacing of supports in inches when the panel is used for sub-flooring with the long dimension across supports. How many sheets are in a unit of plywood? The number of panels in a unit of plywood varies depending on the type and thickness of product. On sheathing products, the piece count is typically stenciled on the side of the unit. Other products have corrugated side protectors that should indicate piece count. If you need a piece count and neither of those are visible please contact GP at 800-284-5347. Does GP's wood come from sustainably managed forests? Plywood panels from Georgia-Pacific are made from wood sourced through a system that is third-party certified to the Sustainable Forestry Initiative® procurement standard. Do your panels meet formaldehyde emissions standards? Yes, Georgia-Pacific plywood and OSB panels only use moisture resistant adhesives that contain no added urea formaldehyde resins, and are therefore exempt from U.S. EPA and California formaldehyde regulations due to their very low emission rates. When used in the manufacture of crates and pallets, are Georgia-Pacific plywood and OSB safe for international shipping?